The age-range is 13 years old to an adult. The two characters are infants ​ ​ for only two pages in the book. They grow in the story fast. An Infant Prince Saka, of the African Kingdom, Ardhi Anasa, through the powers of a Mystical ritual become twin brothers with a baby gorilla named Thundar. They grow up together and find two amulets that give them the ability to communicate telepathically. It also gives them super human powers. Being from the richest kingdom in the world, they are sought after by many different characters, some good, some wicked. They must use their abilities to fight an evil that brings death along for every battle. Basically they become Africa's first protecters! 5 out of 5 stars Unique YA story about the bond between brothers. Wonderful story. Unique plot with many twists and turns.The jungle is filled with portals, vodoo and magical powers. YA book filled with drama and two brothers who share a deep bond. Keep writing MERJr.! 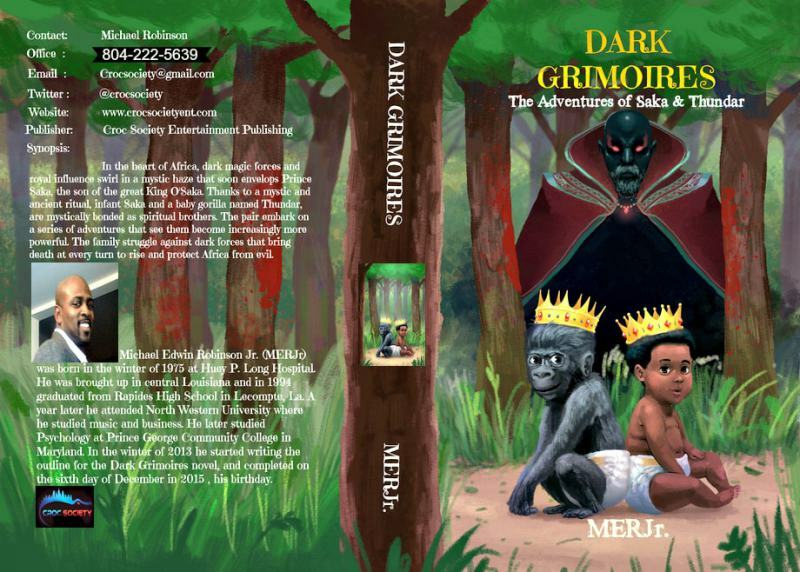 “Dark Grimoires” is the first book that I have read by Michael Robinson and it has given me such a favorable first impression that I am sure that it will not be the last, as I will definitely be keeping in an eye out for future releases. The writing style itself is vivid, visually rich and full of detail that expresses a story that I would say is defined by originality pretty much from start to finish. Honestly, I’m not quite sure what genre I would consider “Dark Grimoires” to be in, simply because it is full of a wide variety of elements that blend together to keep it interesting, hard to predict and exciting to read due to the adventurous feel of the plot. As well as this, I think the majority of the characters are very well-constructed- especially the pair of Thundar and Saka, who have a very creative and unique bond that I think is very admirable. Overall, I loved the read and I recommend it for anyone looking for an adventurous story with a detailed setting, complex characters, and an ultimately unique plot. 5.0 out of 5 stars Aventure book! This is a one kind of different an amazing and entertaining story. I really enjoying every line in this book. Follow Prince Saka and Thudar in an adventure of a life time.This is not only fun there have enough learning point. I want to know more about this story just wait next part. What an entertaining story! Follow Prince Saka and Thudar in an adventure of a life time. Read about them battling evil magical forces meanwhile becoming more powerful themselves. This book was different than what I normally read but it was not a disappointment! I love the relationship and bond that the prince and baby gorilla have. I was hooked right away and love how the author kept it very exciting. This was an awesome book! Dark Grimoires is an epic, fantasy novel filled with magic and intrigue. The story is set in a richly conceived Kingdom in Africa. The characters are compelling and I thought each had great development as the story progressed. Action filled and fast paced, this story was a delight to read from start to finish. The characters share rapid fire dialogue that is really believable. The book is both hopeful and harrowing and I pray there is more of it to come. Also, I think this would be great to read with a young person. Although some scenes are violent, the themes and relationships would be beneficial and enjoyable to a young reader. This book is a well written book great for all ages. Must read book of 2016. 5.0 out of 5 stars An enjoyable fantasy adventure of ‘twin’ brothers set in Africa’s supernatural realm. This is definitely an epic start of an exciting series. The author did an amazing job in creating an intricate story without losing the plot’s direction and momentum. At first, I had a hard time remembering the name of the characters especially the minor ones, but as I go along and immersed myself in a good story like this, I began to differentiate each one. Each character has their own strength and weaknesses. As you read the story, you’ll realize each one has their own role to play and why they are necessary. The amazing world-building, surprising plot twists and flawlessly graphic action scenes will surely keep you hooked until the last page. Looking forward in reading the next in this promising series! Highly recommended!